Teaching Trailers is a very popular educational resource that has been going since 2012. We were tasked with modernising the brand and recoding the entire site to be mobile friendly. 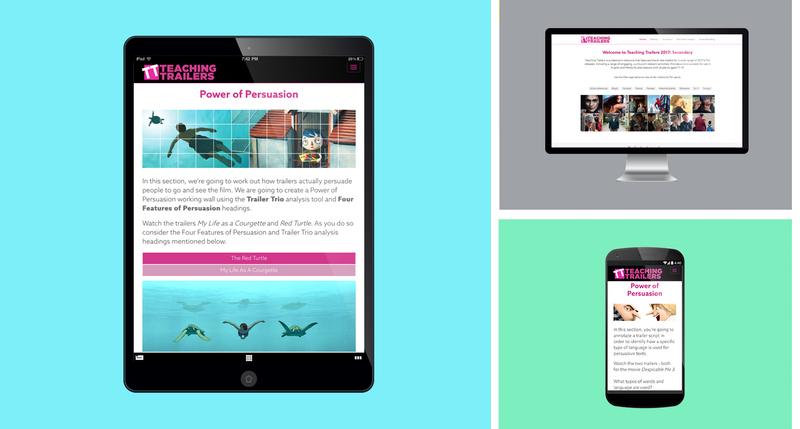 The new site features 30+ trailers, interactive and printable exercises suitable for use in English and Media Studies lessons with students aged 11-18. The 2017 resource includes an exclusive interview with an industry expert, offering unique insights into the purpose and process of producing film trailers. The responsive website uses the Bootstap open source toolkit with a custom built trailer browser. The trailers are hosted by Vimeo with playback monitoring for market research purposes.